At approximately 5-00p.m. on 11th November 1987, building contractor Ed Walters was working in his home office when his attention was drawn to glowing light that seemed to be emanating from behind pine trees at the front of his house. Walters opened his front door and was astonished to see a huge glowing bluish-grey craft hovering about 200 feet above the ground. [ left ]The craft was making no noise at all and, according to Walters, was emitting a "power light" of pulsating energy from its undercarriage. Walters immediately grabbed his Polaroid camera and commenced taking photographs. Ed Walters [ right ] " I was visited by officials from the Air Force, from a department which they later denied existed. There will always be people who choose not to believe, whatever the evidence suggests. 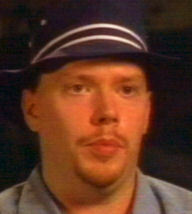 Some simply refuse to accept that UFOs exist, so ultimately they brand me as a hoaxer". In order to get a better view he ran into the street and found himself directly below the strange craft - at this point, maintained Walters, he was blasted by a blue beam which lifted him off the ground to a height of over 3 feet, for about 20 seconds. Walters also stated that there was a strong smell of cinnamon and he heard a voice in his head say "We will not harm you". Walters then crashed to the ground and the UFO had gone. Following this event Walter sent the photographs of the UFO to the local daily newspaper "Sentinel" - this he did anonymously and when the story was published a number of people came forward who claimed to have seen a similar object in the skies - the times of their sightings correlated with Walters' account. Over the following 5 months Walters had many more sightings and managed to take many more photographs. He always seemed to see the same UFO - about 12ft. across and 9ft. high with a brilliantly lit 7-8ft. "power ring" below. Often the UFO sightings were preceded by a hum in his head - leading some investigators to speculate that he had, at some point in time, been abducted, the hum being caused by an implant. It is interesting to note that he had certainly had some peculiar experiences in his youth - one of which could be explained as an abduction. On 2nd December he claims to have encountered an alien to the rear of his house -the alien apparently ran away and on 12th January 1988, he was driving his pickup truck when he came across a UFO hovering over the road. This he was able to photograph but he found himself hiding beneath his truck, paralyzed by a white beam of light. Despite the fact that Walters actually saw occupants leave the craft and approach his pickup, he somehow managed to get back in and drive away. On 7th February 1988, the UFO visited Walters' house again, this time he managed to film his wife, Frances Walters, narrowly avoid being blasted by a blue beam. On 1st May, he photographed the UFO yet once more at 1-10a.m. However, he "blacked out" completely until 2-25a.m. and speculated that he had been abducted - the implant removed. A number of other people in the area of Gulf Breeze had witnessed UFOs and recorded the sightings on video or photograph, their sightings often coincided with the dates and times of Walters' experiences. However, the sceptics were overjoyed when a model UFO was found in the house wh ere Walters had lived. Not only that, a young man claimed that he had helped Walters to fake the photos. The controversy has never been satisfactorily resolved; on one hand a number of sceptics cast doubt on the validity of Walters' accounts and photographs. On the other, a number of experts, including Dr. Bruce Maccabee, Bud Hopkins and Walt Andrus (of MUFON) have endorsed Walters' testimony. Also, Frances Walters has consistently supported her husband's accounts and Ed Walters has successfully passed polygraph tests. Ed Walters' Gulf Breeze sightings have probably generated as much controversy in the area of Ufology as any other incident but whether his evidence is faked or not (and many believe it is), unexplainable sightings of strange objects or craft continue to be seen (and recorded) in the skies over Gulf Breeze. 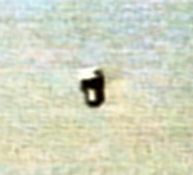 Art Hufford (MUFON) caught this image on film in 1991, the object was witnessed by dozens of people. Bland Pugh took this photo in 1996 - the ring of light is very similar to the ring of pulsating lights emitted from the UFO that Walters caught on film in 1987. UFO captured on video by Michael Hawkins at Redfish Point, Florida, in 1993. UFO filmed by Michael Hawkins at Redfish point - not far from Gulf Breeze. On Saturday 4th March, 2006, Channel 5 Television broadcast “The Real Flying Saucers” (Off the Wall Productions - http://www.offthefence.com/) a documentary covering the development of top secret craft since World War 2. In this documentary the Gulf Breeze series of incidents was discussed by Boyd Bushman. 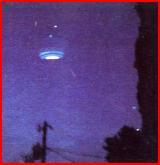 Photograph of UFO taken at Gulf Breeze - Boyd Bushman recognised the technology involved. Boyd Bushman worked for 35 years in weapon design and invented the prototype of the Stinger Missile before moving to Lockheed. Whilst at Lockheed, Boyd Bushman and his team had experimented with different types of energy and when they saw the photos of UFOs taken in the Gulf Breeze area they immediately recognised the technology that was used to power the objects. Boyd Bushman with the hovering coil - never fully understood. Whilst at Lockheed they had experimented with a coil of 250 turns of No. 30 wire simply plugged in to a standard house current. When switched on the coil was seen to lift up and hover. The device, in this state, was extremely dangerous and generated a lot of heat , creating a white glow. It was this glowing coil and white glow which appears in the Gulf Breeze photos that Boyd Bushman recognised. The simple device immediately lifts up and hovers when supplied with a standard domestic current.